Compliance appeared to have been the hottest topic among credit managers of companies presently exporting their goods and services at FCIB’s 25th Annual Global Conference last week. Perhaps the biggest takeaway was that perfection isn’t always necessary to appease governments and regulators, but diligence most certainly is. As previously noted by NACM, regulatory activity and the size of fines for violations of compliance mandates in the United States, and for many other developed economies as well, are growing. Luis Noriega, ICCE, vice president of global trade services with JPMorgan Chase Bank, said the enforcement issue is significant for exporters, down to the product and order level. 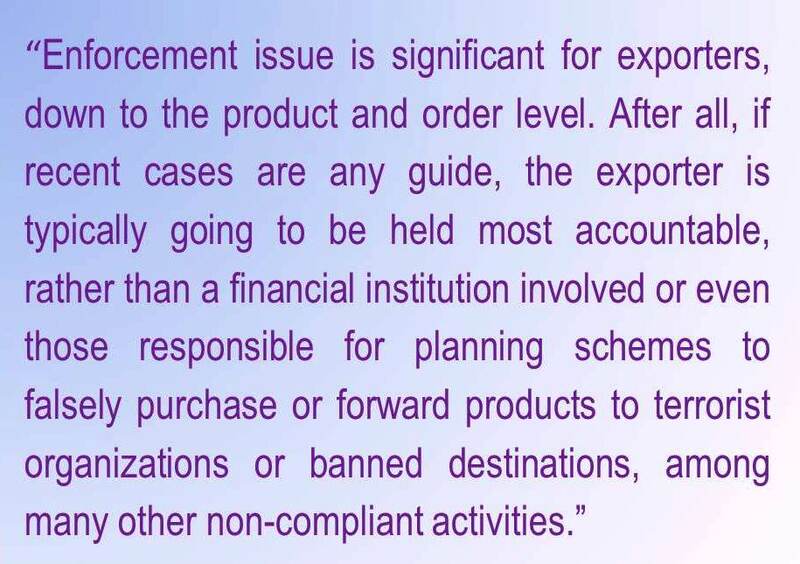 After all, if recent cases are any guide, the exporter is typically going to be held most accountable, rather than a financial institution involved or even those responsible for planning schemes to falsely purchase or forward products to terrorist organizations or banned destinations, among many other non-compliant activities. “All it takes is one event to cause monetary penalties and strict liabilities to companies,” Noriega said. “You can’t rely on other links in the chain, be it the payment system or freight-forwarders. You just need to be ready to assist and defend the fact that you are a party in a transaction.” A big part of defending is documenting your efforts, and doing so honestly, said FCIB Global panelist Jon Yormick, owner of theLaw Offices of Jon P. Yormick Co. LPA. Yormick warned of the importance of due diligence on a growing number of matters like checking sanctions lists, end-user status and information on principals of a company. While difficult to get some of that information, especially if a private company is part of the transaction, technology down to even basic Google Earth searches can help a business plead its case if something goes awry from a compliance perspective. Yormick also strongly suggested against trying to be coy and circumvent compliance laws in any way. “You’re going to get a knock on the door, especially if a competitor finds out about it. The anonymous tip line is a great thing for your competitors,” he warned. Tonya Matney, special agent with Homeland Security Investigations’ Counter-Proliferation Task Force, suggested that helpful tips to stay in the good graces of investigators include performing extra due diligence when doing business somewhere that is a common area for trans-shipping activity (United Arab Emirates, Jordan, Thailand, etc. ), following up when documentation is incorrect or inconsistent, applying for proper trade licenses when needed and, when something seem amiss with a request or order, providing a little cooperation.